Join Nikki Warner as she celebrates her 500 followers with a giveaway! 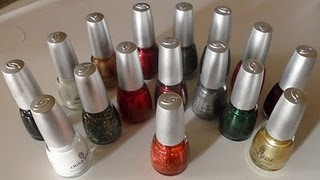 Prizes to be given away are 16 polishes from the China Glaze Tis the Season collection to 2 lucky followers! This is an international giveaway for GFC follower publiclys. To get extra entries when you blog about this giveaway, post on your sidebar, and on your facebook account. Giveaway ends November 26, 2010 at 11:59 pm PST.